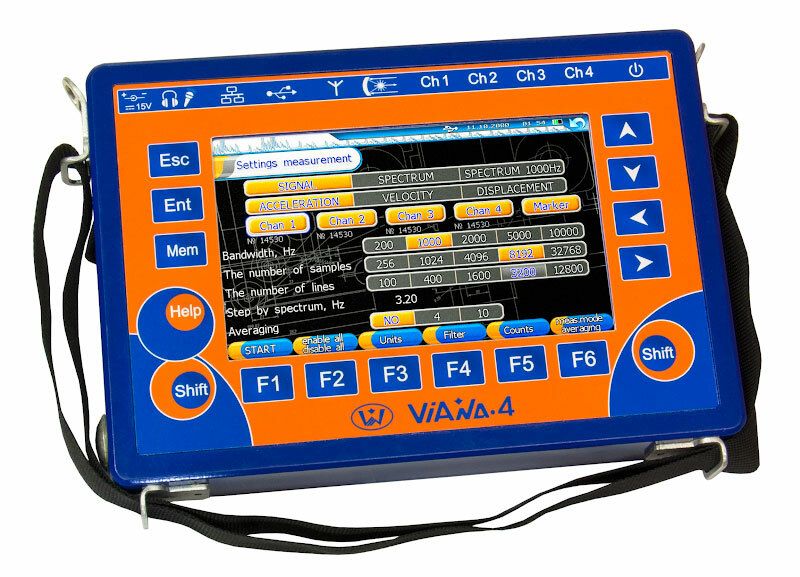 "ViAna-4" (Vibro Analyzer, 4 independent channels) multipurpose portable device is considered to be the most effective vibration signal measurer and analyzer among the Vibro-Center products. The device functional and diagnostic capabilities match those of the devices produced by the world leaders in the sphere of vibration measurement and diagnostics. Flexible configuration of the measuring system, which can include up to four vibration sensors, connected by cables and up to 10 3-axial sensors connected via the radio channel. Quite a vast range of functions for the measured data processing, analyzing and displaying. Built-in functions of multiplane balancing of rotors in their own bearings and the laser tachometer probe. The possibility of using "ViAna-4" device as a monitoring device for starting and commissioning operating modes of equipment. In this case the digital recorder mode or Coast Down/Run Up mode is convenient to use. The device synchronously measures the vibration signals from all the connected vibration sensors and a tachometer probe. The simultaneousness of vibration measurement is especially important for the diagnosis of complex defects. The spectrum frequency can be configured for up to 10 kHz and up to 12,800 lines. This resolution allows separating vibration from the different machine parts and diagnosing it. The signals can be stored in the device memory and further viewed or downloaded to PC into "Atlant" software. "ViAna-4" device allows balancing up to 4 planes and up to 4 measuring points. For accurate determination of the heavy point angle in the device there is a slot for the laser tachometer probe or current clamp connection. Balancing can be performed both by the test start-ups and by the previously calculated coefficients of influence. Multi-channel digital recorder with 10 hour non-stop recording. This option is useful for specialized works, as it allows detailed non-stop analyzing of run ups and coast downs of the rotor and other continuous operating modes. Measurements during Run ups and Coast downs; resonance analyses. Vibrometer mode for fast RMS vibration measuring, assessment of the machine condition and storing measurements for "Aurora-200" software. 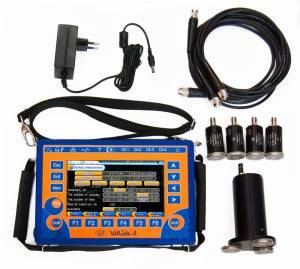 Vibration measurement of the equipment using routing technology that allows easy creation of service system based on periodic monitoring. Diagnostics of rolling bearings and gears by the envelope spectrum. 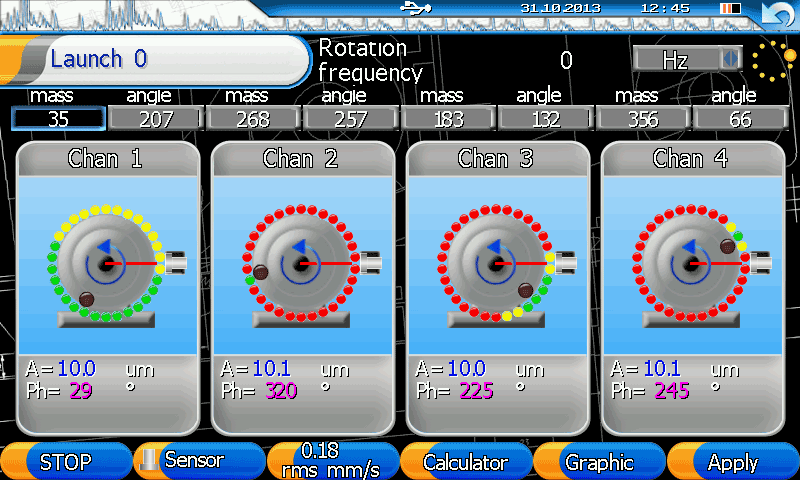 Parameter assessment for the shock pulses coming from the roller bearing defects. Measuring of free oscillations, calculation of the damping coefficients and natural frequencies (modal analysis). Shaft orbit registration at two points and two directions simultaneously. Analysis of the current spectrum around 50 Hz (60 Hz) with the resolution of 0,01 Hz. This analysis is performed using a current clamp connected to the tachometer probe input. This identifies broken rotor bars and other electromagnetic problems with the engine. 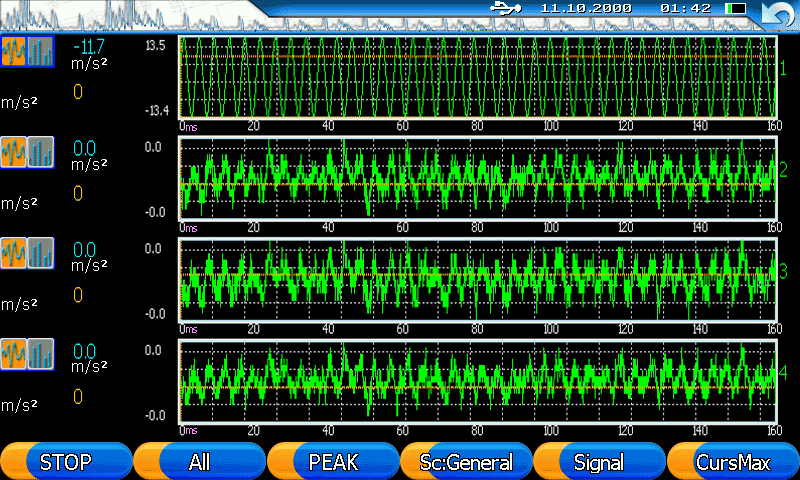 "Atlant" software provides even wider range of diagnostic tools. 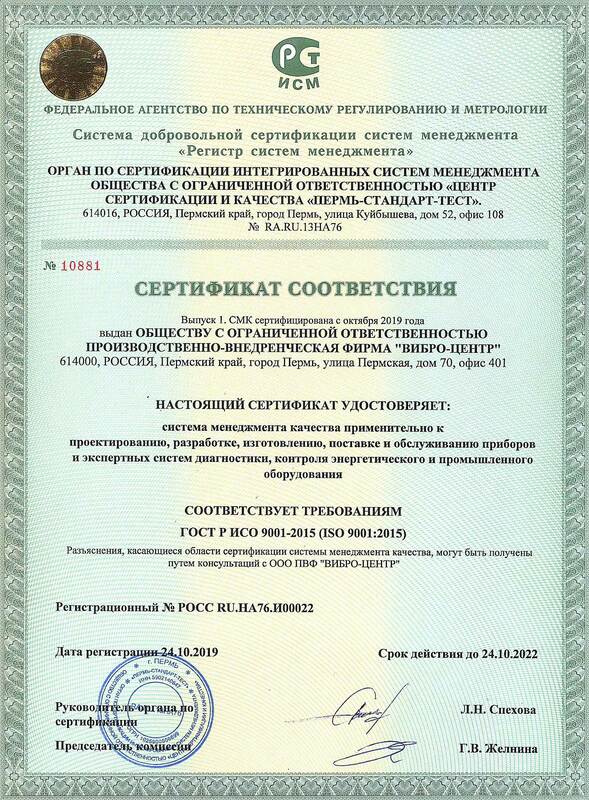 The software includes a multi-level measurement database, a wide range of tools for the measured data analysis and graphical representation, as well as the expert diagnostic system. "Aurora-2000" software allows you to quickly assess the condition of a large number of machines, to generate reports about the equipment condition and to plan for the future repairs by predicting the equipment condition change. The software is a free of charge. Download the latest versions from our website. "ViAna-4" measuring device, with membrane keyboard and a bright color display extended for expanded temperature range. "VC-310A" vibration sensor (4 pieces) with magnetic mount and connecting cables 3 meters long. Laser tachometer probe, universal magnetic base, connecting cable, reflective labels needed for rapid balancing of the rotors in their own bearings. The current sensor "clamp" for the diagnosis of broken bars in the rotors of asynchronous motors. "Atlant" and "Aurora-2000" software for processing and storing data on the PC. This software includes expert diagnostic system. 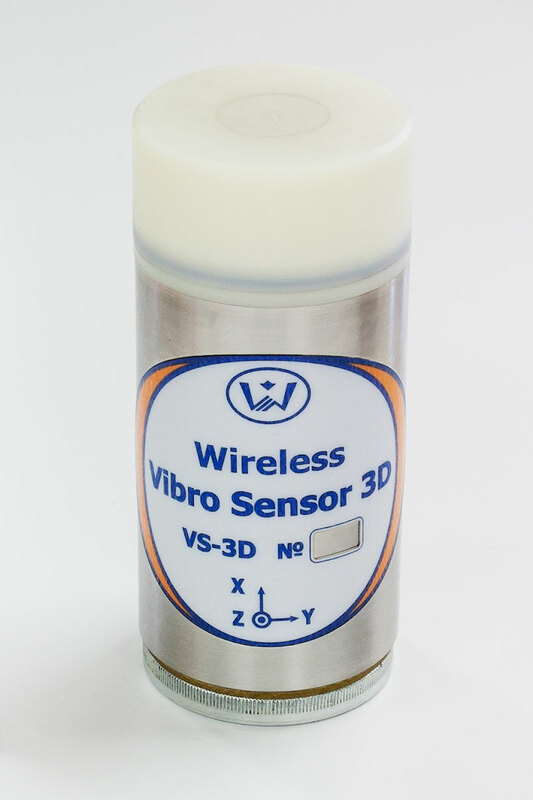 "VS-3D" 3-axial vibration sensors. These sensors has got autonomous power supply, and use a wireless interface for communication with "ViAna-4" device. The sensors' memory capacity is sufficient for using them as stand-alone devices for equipment condition monitoring - the data loggers. In this mode the sensor automatically does measurements according to the schedule. The wireless sensors start measuring at the trigger pulse from the device. After measuring the data is downloaded from the loggers to the device via radio channels for viewing and processing. With "VS-3D" sensors "ViAna-4" device can be used for condition diagnostics of "distributed" objects, various constructions, bridges. The vibration sensors are connected to "ViAna-4" device via standard two-wire ICP interface, thus any other sensors with the same interface can be connected to the device. The presence of the radio channel allows including additional radio sensors into the measuring circuit, at present these are "VS-3D" 3-axial vibration sensors. The measured data is downloaded to PC via USB 2.0 interface. For connection to a computer network the device is equipped with a standard Ethernet connector. It is convenient for the data exchange, storage and processing. The device can be connected to a PC via WI-FI, which is especially convenient during starting-up and adjustment works. Color display resolution 480 * 800, 7"
Too expensive? Vibro Vision-2 - a single-channel analyzer of vibration waveforms with the function of roller bearing diagnostics.